Scenario: Your loved one was admitted to Glacier View Lodge and within a short period of time suffered several falls. You may wonder why this is happening and what is being done about it. Hopefully the following information can address your concerns. The stress of relocation and an unfamiliar environment can increase the frequency of falling. If your loved one has been used to “furniture surfing” at home they may lack the endurance and muscle strength required to ambulate within the larger area of the facility. If your loves one has a dementia they may become more restless and confused. New surroundings with new hazards, combined with over-exertion due to restlessness, put your loved one at a higher risk of falling. If medications were taken inconsistently at home your loved one may develop side effects once they start taking these medications as prescribed. This can lead to dizziness or sedation which in turn can lead to falling. 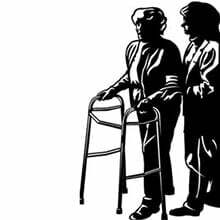 Our goal is to keep your loved one safe and to help them improve and/or maintain their balance, strength, walking ability and general physical functioning.Our focus is on “restorative care”. We utilize the services of an Occupational and a Physical Therapist to develop individualized exercise programs. Our exercise room includes strength training stations and a “Vibrafit” machine. In addition, we have installed a walking track that features a walking harness that can provide postural support for residents who require an assist to get “back on their feet”. We have trained staff members who work with residents to help them meet their rehabilitation potential. We also offer nursing assessments to ensure that we address other factors such as your loved one’s medical condition, medications, and ability to adapt to facility living. We are proud to be a “least restraint” facility. If a restraint is deemed necessary it is only applied in consultation with you and your loved one’s doctor.